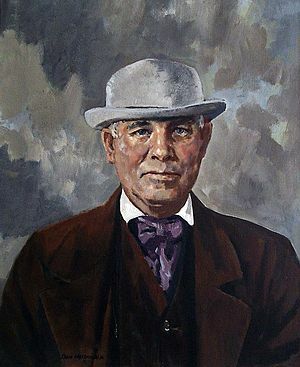 The first Canadian to win the title “World Wheat King” was John Brick, a Church of England minister, who did some farming in the Peace River area of Alberta as a hobby! Brick came from England with his wife and four children and studied theology in Ontario. Fascinated by stories of the West, he received permission to start a mission at Dunvegan on the Peace River. When he had built his church, Brick decided to do some farming. After five years he returned to Toronto where he raised $5,000 for his mission. The Federal Government was interested in his farming experiment, and contributed $2,000. and harvested an amazing 72 bushels to the acre. The crop had to be cut with a sickle and threshed with a flail on the floor of the church! Somebody suggested to Brick that he send a sample of his wheat to the World’s Fair at Chicago, which he did more as an advertisement for Peace River than in the hope of winning an award. In order to ship it, he had to make the ten-day journey to Edmonton when the temperatures dropped as low as -51° C (-60° F) along the way! Then the news came. Wheat from Peace River had won the World Championship! Where was Peace River? Finally the newspapers located it and there was more astonishment. John Brick and the people of Peace River did not hear the news until many weeks later. There is now a bronze tablet at the town of Peace River commemorating the great achievement of the parson with the wheat crown. If you would like to learn more, I suggest visiting History is Where You Stand by Dorthea Calverley.